This dog has the pool to itself… and so he makes the most out of it! In this summer heat, the dog is enjoying the pool… but not only that, he enjoys the pool side as much as he enjoys bones! He keeps on using the slide and he loves it so he goes back to slide down again! Such an energetic dog! Does your dog enjoy slides like this Doberman? If yes, record a video of them sliding and share it in the COMMENT section below. 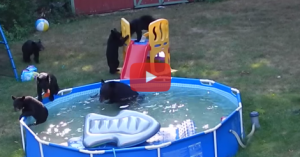 This Family Of Bears Take Over A Cool Spot On A Hot Day…Too Bad It’s In Their Back Yard! OH NO!